I often say that it was really motherhood that launched me into body image activism. Watching my body change so intensely during pregnancy, seeing what it could do during childbirth, and the overwhelming period of post-partum was a crash-course in self-acceptance. I began to think that there must be a new way to relinquish the body shame of my past - for myself and my child. Fast-forward a decade and a half and I’m now the mother of three young children. A few years ago, in a radical act of self-love and body positivity, I stripped down to a blindfold and a black bikini as a fat, forty-year-old mom in a busy market downtown Boise, Idaho. I had markers in my hand and a chalkboard sign at my feet asking people to draw a heart on my body if they’d ever struggled with a self-esteem issue and believed all bodies are valuable. Afterwards I got a message from a mother with a page of homework from her six-year-old daughter, with an answer to the question “Have you ever been teased?” followed by a drawing and the answer “one time someone said my legs were fat.” There is a real war being waged right now on people of size and our children are the most vulnerable victims. 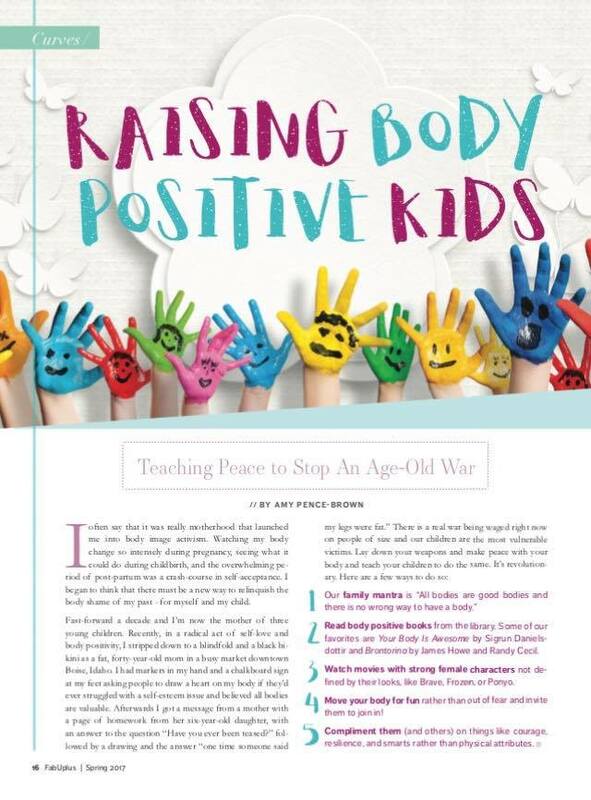 Lay down your weapons and make peace with your body and teach your children to do the same. It’s revolutionary. I spend a lot of time at home and making it as comfortable and radical a space I can is important and conducive to not my growth and that of my family. Here are a few of my favorite (and easy!) ways to make your family life and home more body positive. My daughter, Alice, hand drew this We Are All Unique coloring pages for our Boise Rad Fat Collective events. The All Bodies Are Good Bodies coloring pages underneath were created by Idaho artist Jenny Hefner. Me speaking on body positivity to a crew of 5th and 6th graders at the Foothills School of the Arts & Sciences in 2017. Their teacher instructed us to give our most powerful pose for this photo together. This print is titled Rad Women and made by artist Cassandra Schiffler based on tracings of the diverse bodies of women at my first RADCAMP: A Body Positive Boot Camp for Feminists in 2017. She gifted this to me and it now hangs in my home. 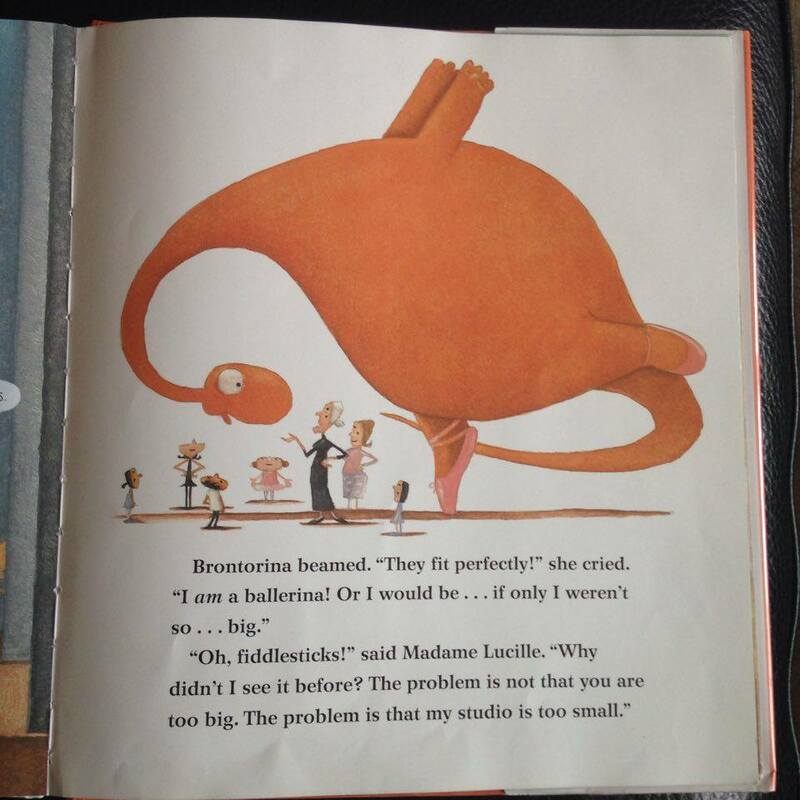 A page from the kids’ book Brontorina, one of our body positive family favorites. Our family mantra is “All bodies are good bodies and there is no wrong way to have a body.” We have a coloring page stating such hung on all our bathroom mirrors as a reminder. Read body positive books from the library. Some of our favorites for kids are Your Body Is Awesome by Sigrun Danielsdottir and Brontorina by James Howe and Randy Cecil. Put something new and rad on your shelves for you while you’re at it. Treat yourself to Charlotte Cooper’s new book Fat Activism: A Radical Social Movement or buy the DVD of the movie Patti Cake$. Enjoying body positive books and movies are a fun and educational way to move forward on your own body positive journey. Some of my favorite family-friendly movies with strong female characters not defined by their looks are Brave, Frozen, Penelope or Ponyo. Move your body for fun rather than out of fear and invite your kids to join in! This can be as easy as gardening, walking to school or riding your bikes to the grocery store. Compliment your kids (and others) on things like courage, resilience, and smarts rather than physical attributes. Get rid of that bathroom scale. Give it away to the thrift store or ceremoniously smash it with a hammer. Your gravitational pull on the earth is irrelevant and has no bearing on who you really are. Buy and hang some size-positive art. Surrounding yourself with inspiration and beauty is good for the spirit. There are many artists creating beautiful images of fat folks and diverse bodies (Instagram and Etsy are my favorite places to shop). You can also have your kids create some of their own! Clean out your closet - and everyone else’s, too. Just like the number on the scale is meaningless, so is the number on the tags of your clothing. Keep things that fit well and make you feel fantastic and donate the rest. Years ago I took on the challenge of making every single recipe out of this cookbook in one year’s time. It provided our family with a fun culinary adventure and learning about different kinds of foods and how to plan for recipes. In addition to spending summer weekends camping and hiking with our kids and working often at the school garden, we love to take them skiing and sledding, which are fun and easy ways to move our bodies outdoors. Food for thought from a fat feminist mother. Blog formerly known as Doin' It All, Idaho Style, started on Blogger in 2009. Sign up with your email address to receive food for thought from this fat feminist mother in your inbox. Thank you for supporting this radical feminist voice for change! © Amy Pence-Brown and www.amypencebrown.com, 2009-2019. Unauthorized use and/or duplication of this material without express and written permission from this site’s author and/or owner is strictly prohibited. Excerpts and links may be used, provided that full and clear credit is given to Amy Pence-Brown and www.amypencebrown.com with appropriate and specific direction to the original content.